The International Federation of Horse Racing Academies, IFHRA, at its General Assembly meeting held on Friday, May 29, 2015, at Marriott Hotel, Warsaw, Poland, unveiled an innovative IFHRA Racing Scholarship Fund (RSF) and also admitted 14 new members to the Federation. An amount of US $100,000 has been earmarked for the IFHRA Racing Scholarship Fund and is expected to initially benefit between 10-20 apprentice jockeys to spend around two months each with reputed mentors. The concept is based on providing students with valuable continuing educational opportunities in the event they choose a new path within horse racing and related industries. 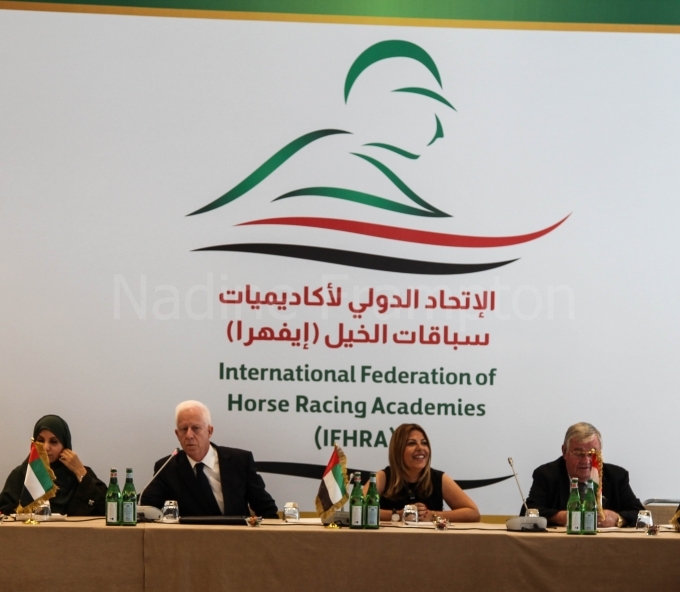 The IFHRA meeting was held on the sidelines of the The HH Sheikh Mansoor Bin Zayed Al Nahyan Global Arabian Horse Flat Racing Festival’s sixth World Arabian Horse Racing conference held in Warsaw in Poland. 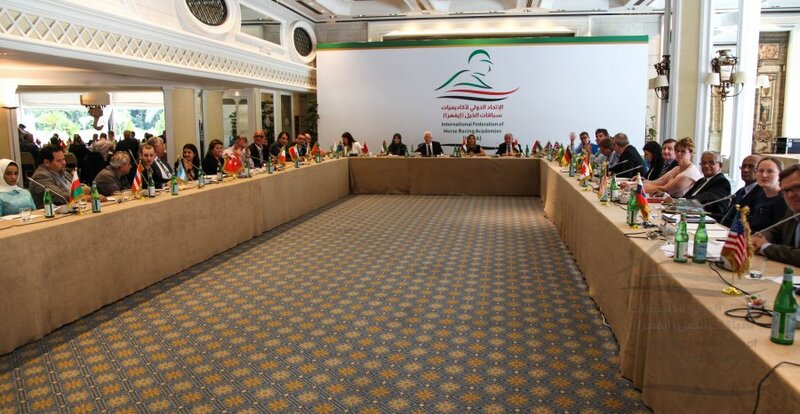 Meanwhile, IFHRA also admitted 14 new members to its body during this meeting including Argentina, Brazil, China, Denmark, France, Hong Kong, Hungary, Morocco, Sultanate of Oman, Portugal, Poland, Turkey, Slovakia and Sweden whereas the membership of two more countries, Bahrain and Switzerland, are pending. The Federation also appointed Mr. Pat Buckley as the Vice- Chairman following the demise of Ms Susanne Santesson earlier this year. At the outset IFHRA members were urged to provide details on a regular basis for the official website to benefit all equestrian aficionados. The meeting also decided to form a sub-committee to look into the insurance aspect for participating apprentice jockeys. IFHRA was founded in 2014 under the instructions of HH Sheikh Mansoor Bin Zayed Al Nahyan, UAE Deputy Prime Minister and Minister of Presidential Affairs and had a record number of 18 countries at the time of inception. It has its headquarters in Abu Dhabi, UAE. The next IFHRA meeting will be held during the Abu Dhabi International Hunting and Equestrian Exhibition, ADIHEX which will be held in Abu Dhabi from September 9 to 13, 2015. IFHAR Chairman Ms Lara Sawaya invited all IFHAR member-countries to make use of this opportunity and represent their countries at the IFHAR stall. The much-awaited Racing Scholarship Fund, RSF, a first of its kind mentorship programme, initiated by the International Federation of Horse Racing Academies (IFHRA), headquartered in Abu Dhabi, kick-started with British apprentice Tom Marquand heading for his mentorship programme to Victoria, Australia on January 7, 2016 and Ryan Colley from York representing the Northern Racing College in Doncaster, heading to Lexington, Kentucky, US on January 18. The 18-year-old jockey/rider Tom had a four-week mentorship programme, whereas Ryan attended an eight-week programme in Lexington, Kentucky, after taking a break as assistant trainer at Ruth Carr’s North Yorkshire Horse Racing stable. The funding for the programme is being done by His Highness Sheikh Mansoor Bin Zayed Al Nahyan Global Arabian Horse Racing Festival. As many as 12 candidates have been selected under the RSF programme from different countries and Tom was the first candidate to start off this eagerly awaited sponsored event. Tom was assisted in his training by Richard Perham of British Racing School of UK and Matt Hyland and Melisa Weatherley in Victoria, Australia. Any candidate between the age group of 18-29 and employed within the racing industry either as an amateur jockey or apprentice jockey or involved in some other racing activity is eligible for this scholarship fund. The His Highness Sheikh Mansoor Bin Zayed Al Nahyan Global Arabian Horse Racing Festival-supported mentorship programme lasts a maximum of eight weeks and takes place in a country other than where the incumbent resides. According to the RSF guidelines, the candidate should have finished at least one year or graduated from a racing academy based in his/her home country or other entity that provides horse racing or related industry workforce training. Ms Lara Sawaya, Chairperson of the International Federation of Horse Racing Academies (IFHRA), Executive Director of the HH Sheikh Mansoor Bin Zayed Al Nahyan Global Arabian Horse Flat Racing Festival and Chairperson of Ladies & Apprentice Racing Committees in the International Federation of Arabian Horse Racing Authorities (IFAHR), thanked HH Sheikh Mansoor Bin Zayed Al Nahyan, UAE Deputy Prime Minister and Minister of Presidential affairs, for his innovative initiative in evolving a plan to train and fund young riders. “The IFHRA Racing Scholarship Fund (RSF) is designed to benefit both students of IFHRA member racing academies and employers within the horse racing and related industries. Students will work abroad in real-world situations gaining experience and benefitting from mentorships which will be a long-term benefit to future careers. At the same time, future employers will also benefit from students who have experienced from the IFHRA RSF and who have therefore gained training in the newest practices our industry offers,” Ms Sawaya said. The board had received 19 applications for the scholarship scheme out of which the RSF Selection Committee zeroed down on 12 applicants representing different countries. Others selected are from Australia, Canada, Hungary, Ireland, Korea, Poland, Puerto Rico, Sweden, Turkey and the United States. Both the youngsters thanked IFHRA and His Highness Sheikh Mansoor Bin Zayed Al Nahyan Global Arabian Horse Racing Festival for their extraordinary and unique venture which will help youngsters like them to learn new racing techniques. Ms Lara Sawaya was immensely happy that the second student had already taken to the wings at such a short period with the first student still on the field. “The initiative of HH Sheikh Mansoor Bin Zayed Al Nahyan is encouraging many youngsters to learn new skills in riding and providing them new opportunities to learn different riding skills from countries other than their own birth country,” she said while thanking His Highness Sheikh Mansoor for his financial and moral support for such a unique training programme.